I. Charles Overton: He found that the substances which dissolved in lipids enter more rapidly than substance insoluble in lipid. Therefore, he concluded that plasma membrane was composed of lipid. I. Langmuir: Ile made artificial membranes by adding phospholipids in benzene to water. Benzene evaporated and phospholipids membrane was formed. 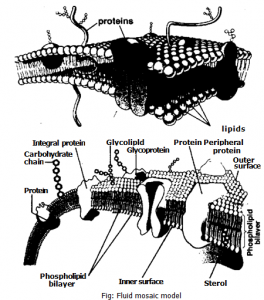 E. Gorter and F. Grendel: They described that cell membrane is actually phospholipids bilayers. The hydrophobic ends of the phospholipids molecules are directed inward and hydrophilic ends of the membrane are directed outward. Goner and Grendelalso tried to measures the exact contents of plasma membrane But they failed. electron microscope. Plasma membrane is 7 to 8 I1111 in thickness but membrane of mitochondria was only ón in in thickness. The percentage of lipids and protein Vnas also not similar in plasma membrane and other membranous organelles. (h) There )sas controxersn about, the placement of protein molecules. Many researchers did not accept the location of protein as described in Sandwich model. Protein molecules also have hydrophobic and hydrophilic ends. Hydrophobic end cannot be placed on hydrophilic end of lipid. Similarly. hydrophobic end of protein cannot be placed outward in water. are called hydrophilic (“water attracting”). (b) Nonpolar end ‘or tails: It has fatty acid molecules. Nonpolar ends face each other in the middle of the bilayer. 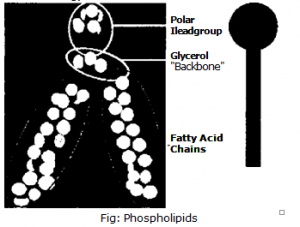 The “tails” of both layers of phospholipids molecules attract each other. So they are repelled by water. Thus they are called hydrophobic, (water dreading). Cholesterol is also present in the plasma membrane. The cholesterol molecules are embedded in the interior of the membrane. They make the membrane less permeable for water-soluble substances. Cholesterol molecules make the membrane rigid structure. Thus the cholesterol molecifies stabili/e the membrane. Peripheral proteins: They are attached to the inner or outer membrane surface. (a) Some intrinsic proteins are Links to sugar-protein markers on the cell surface. (b) Some intrinsic proteins move ions or molecules across the membrane. to various molecules outside the cell. (a) Glycoproteins: The carbohydrates unite with proteins and thrill glycoproteins. (h) Glycolipids: The carbohydrates unite with lipids and form glycoliptds on the surface of a plasma membrane. one part of the cell to another. It separates the inside of the cell iron the outside. It separates various organelles within ‘ic cell. It provides a large surface area on which specific chemical reactions can occur. It separates cells from one another. 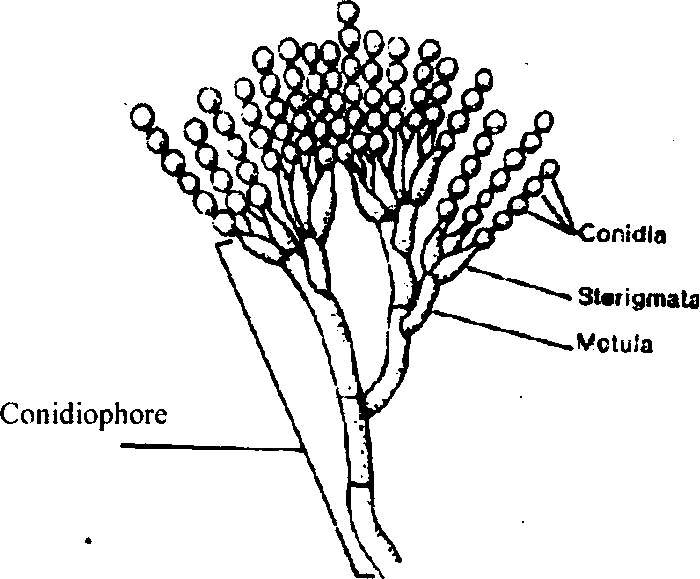 There are sites for receptors on the cell membrane. These receptors contain specific cell identification markers. These markers differentiate cell t.spe from other cells. The plasma membrane allows some substances to moves in and keeps others out. It it; called selective permeability. It is essential for maintaining cellular homeostasis. The maintenance of a constant internal environment despite fluctuations in the external environment is called hontoeostasis. Molecules can cross membranes in a number of ways. ‘Nes/ may use their ONA n energy. Or they rely on an outside energy source. 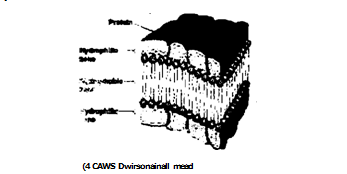 There are following types of cell moscutoffs. concentration to the area of lower concentration is called simple diffusion. The molecules move randomly. They keep on moving until they are distributed evenly. They come in a state of dynamic equilibrium. Most of the short distance transport takes place by simple diffusion. conic iii contact with the IR t15,1,1101lie er. Large molecules and lipid insoluble molecules require assistance for their passage through plasma memhranc. Therefore. these molecules use facilitated dilluSi011. I he facilitated diffusion also does not require energy. A molecule temporaril) hinds with a carrier protein in the plasma membrane. It is transported from an area of higher concentration to the area of lo“er concentration. The diffusion of water across a selectively permeable membrane from an area of higher concentration to an area of lower concentration is called osmosis. Osmosis is just a special type of di flusion. The relative concentration of solutes in the water inside and outside the cell is called tonicity (Or. tonus, tension). There are three types oftonicity. (a) Isotonic solution: In this case the solute concentration is the same inside an outside the cell. For example, a red blood cell. The concentration of water molecules is also the same inside and outside the cell. Therefbre, water molecules move across the plasma membrane at the same rate in both directions. Thus there is no net movement of water in either direction. (b) Hypertonic solution: In a solution, the solute concentration is higher outside the cell than inside. Thus concentration of water molecules inside the cell is higher than outside. So water moves out of the cell. The cell gets shrink. This condition is called plasmolysis. (c) Hypotonic solution: The solute concentration is lower outside the cell than inside. Thus, the concentration of water molecules is higher outside the cell than inside. As a result, water moves into the cell. It may cause bursting of cell. The movement of molecules form the area of lower concentration to the area higher concentration by the expenditure of energy is called active-transport. Active transport takes place against a concentration, gradient. This movement against the concentration gradient requires ATP energy. The active transport process is similar to facilitated diffusion. But the carrier protein in the plasma membrane must use energy to move the molecules against their concentration gradient. droplets of extracellular fluid is called pinocytosis. Any small solid dissolved in the fluid is also taken into the cell. Pinocytosis occurs when a small portion of the plasma membrane invaginates during pinocytosis. The open end of the invagination joins to form a small vesicle. This tiny vesicle detaches from the plasma membrane and moves into the cytoplasm. form a phagolysosome (digestion vacuole). Finally, the lysosomal enzymes break down the contents of vesicle.